Having a spare set of cables on hand is good insurance when shooting in the field or on location. 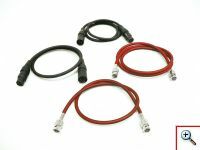 This BNC - XLR package includes two BNC-BNC cables (24 inches long for the operator end and a 36 inches long for the camera end), and two XLR cables (male/female, also 24 inches and 36 inches long). Extra cables are always handy to have around as they will get loaned out or misplaced at a critical moment.